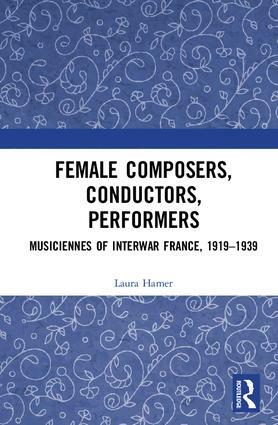 Dr Laura Hamer’s new monograph, Female Composers, Conductors, Performers: Musiciennes of Interwar France, 1919–1939, has just been published by Routledge. The book considers a wide range of female composers working in interwar France, including the early Prix de Rome winners, Marguerite Canal and Jeanne Leleu; the only female member of Les Six, Germaine Tailleferre; and Paul Dukas’s female composition students Yvonne Desportes, Elsa Barraine, and Claude Arrieu. Consideration is also given to the conductor Jane Evrard and her Orchestre féminin de Paris, as well as to the all-woman Orchestra of the Union des Femmes Professeurs et Compositeurs de Musique, a contemporary pro-suffrage organisation that was dedicated to defending the collective interests of female musicians and campaigning for their employment rights. Beyond women composers and conductors, the book also considers female performers, particularly Marguerite Long, Ginette Neveu, and Wanda Landowska. 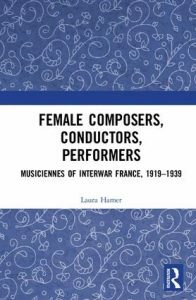 The book positions the activities and reception of female musicians against a contemporary socio-political climate that was largely hostile to professionalism amongst women, and also against the development of interwar French feminism.